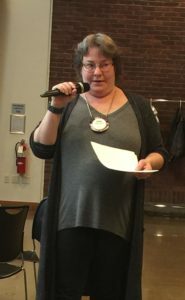 Auction Chair Denise Bacon gives a status update. Our biggest fundraising event of the year–which provides many scholarships for local students in need– is only 6 weeks from this Saturday! Yikes. 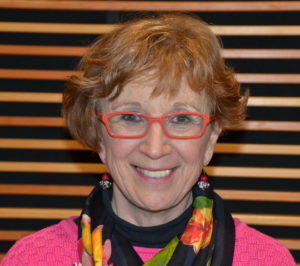 To help kick us into gear, last week’s program featured a status update from Auction Chair Denise Bacon. So far, 66 dinner tickets have been sold. 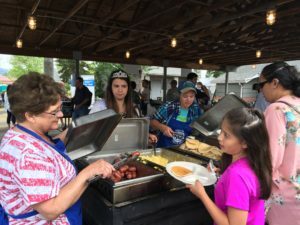 “Ticket sales barely cover the cost of the food,” she said. “That’s why sponsorships are so important.” If you haven’t bought your tickets yet, better get online and do it–our event is going to be featured in an upcoming edition of NW Wine magazine, which should spur demand. Golden Tickets still available! Golden tickets cost $100 each and give you a chance to win the ability to pick any oral auction item before the auction starts. Some great oral auction items have been donated, including a night in Seaside/Cannon Beach with candy from Bruce’s Candy Kitchen. Special Package–only 3 left! Have you heard of the fabulous package you can buy right now that includes 1 night at the Allison Hotel, 2 dinner tickets, 1 Golden Ticket, 1 bottle of wine and a $50 gift certificate to the Jory Restaurant? If this sounds good, better hurry…. Steve Palmer gives an update on wine donations. Even with this great news, “We have big, big shoes to fill and still need to have a lot of wine donated,” Steve said. If you are a wine club member or know a winemaker personally, please consider asking for a donation. “The inside connection really helps,” he said. Four or five people are also still needed to volunteer to pick up donations. 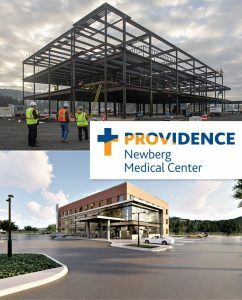 Once you have a donation, please take it to Newberg Ford. All donations are needed two weeks before the event to have time to catalog and to include in the program. Thanks to Karl Hughes for doing the event poster and donor flier. The deadline for ads and listings in the catalog is April 1. For more information, please go to the auction website. Past President Jeff Lane (right) received acknowledgement and a pin from PDG Mike Caruso for being a “Paul Harris +5,” which means he has given in excess of $6,000 to the Rotary Foundation. Congrats and many thanks to Jeff. Dylon Brown was the guest of Dale Welcome. Dylon is the new pastor at Newberg Nazarene Church and just moved here about 3 weeks ago from Phoenix, Arizona. 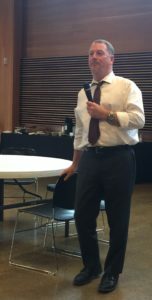 Dale Welcome discusses the upcoming 6k for clean water around the globe. 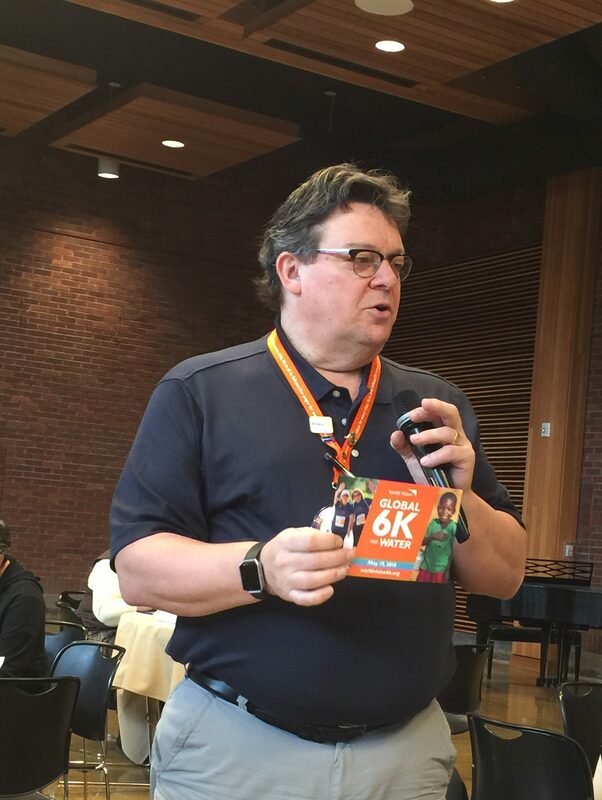 Speaking of Dale Welcome, he informed us of a new family event he is hosting called “Newberg Water for Life” on Saturday, May 19. Sponsored by World Vision, it’s a global 6k walk/run to help bring clean water to people in need. Registration is $50 and includes a unique race bib with the photo of a child benefiting from clean water, as well as a tee-shirt. To register, go to worldvision6k.org. If you can’t do the event, please consider a $50 donation. 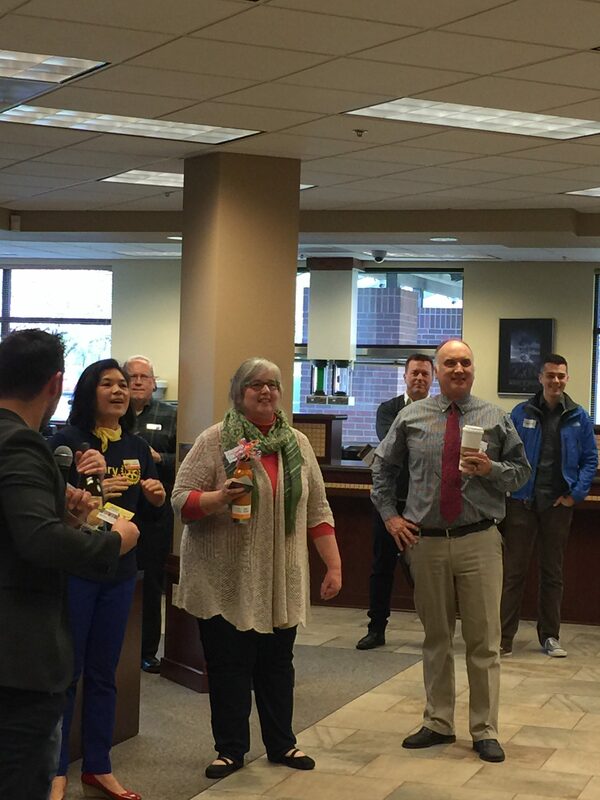 Om (left), Leah and Terry discuss the auction at Premier Community Bank last Friday. A delegation from the club, including Denise Bacon, Om Sukheenai, Leah Griffith, Terry Weldon, Jim McMaster, Judy Robinson and others, promoted the annual auction last Friday at the Chamber of Commerce monthly “Greeters” event at Premier Community Bank. Dr. Angel Pilato honors Vietnam vets Ralph Koozer, center, and Walter Want, right. In 1967, she was attending Michigan State, where it was snowing, and working on her masters. Long story short, she wanted to help and do more with her Food Management degree from the Rochester Institute of Technology. She ended up enlisting in the Air Force, hoping to be sent to someplace sunny for training. Instead, her first assignment was in Omaha, where it was–snowing! She was transferred to Seville, Spain where her new commander declared, “No woman is going to run my Officer’s Club.” Luckily, a new commander came and rescued her from a keypunching job. Her next assignment was at the large Bitburg Air Base in Germany. She left the service in 1972. In the 1980’s, she started sharing her war stories at a dinner party, and she was encouraged to write a book. So she did. 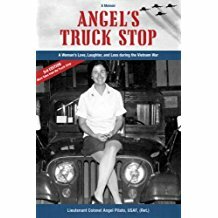 Her memoir, “Angel’s Truck Stop, A Woman’s Love, Laughter, and Loss during the Vietnam War,” highlights some of the challenges, conflicts and choices she confronted. “What did I learn during my career?” she asked. “Persistence and grit. That it’s better to ask forgiveness than permission. That you don’t have to be shot at to suffer the wounds of war. To forgive yourself when you misstep. And that writing can heal your soul. Did our citizens learn anything from the Vietnam War? That the warriors ARE distinguishable from the war. Did the government learn anything?” She left that one with question marks. 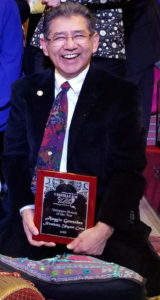 Auggie Gonzales smiles as he receives the “Volunteer of the Year” award from the Chamber. Shortly after receiving the Chehalem Valley Chamber of Commerce’s “Volunteer of the Year” award, Auggie Gonzales left last week for Guatemala to serve some more! 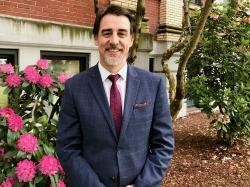 He is heading up a delegation which includes dentists and dental hygiene students from both Pacific University and OHSU (as well as wife, Maureen, a physical therapist). 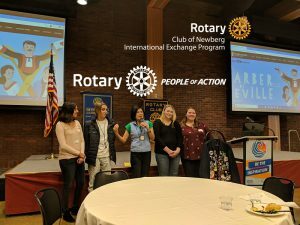 If you haven’t checked out his blogsite yet, here is the link: https://newbergrotaryclub.wordpress.com. Please join your fellow Rotarians this Friday, March 9, from 8 to 9 am at Premier Bank as we host the Chamber of Commerce Greeters event. Applications for this summer’s RYLA camp are now open. RYLA, which stands for Rotary Youth Leadership Awards, is a leadership development program for young people ages 19 through 26. It will be held July 14 through 21. For more information, please contact Aaron Lewis or Om Sukheenai. April 28…April 28….April 28…..you know what that means! Our annual auction is coming right up! 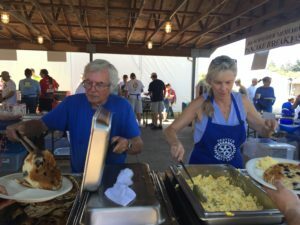 Local graphic designer Gail Watson, our newest “Friend of Rotary,” joined us last week. Special acknowledgement to Marge O’Connell, Judy Robinson and Paula Radich for getting club tee and polo shirts designed, ordered and delivered. They really look great! Karen Jones reported on the “Dream It, Be It” event for high school girls held by the Soroptimists Club a week ago Saturday. Thirteen girls attended the career exploration seminar this year. 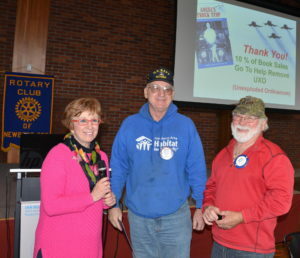 Karen thanked our club for being a co-sponsor and donating $500. Welcome back to Mike Caruso, who journeyed all the way to Beirut, Lebanon to attend the second Rotary Presidential Peace Conference. 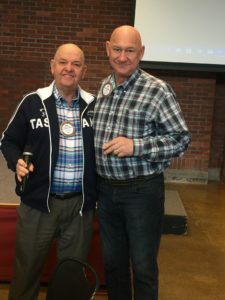 Mike traveled with Alan Bazzaz, from the Lake Oswego club, and the two came back with ideas for working with Rotary clubs in Lebanon on a number of projects and global grants related to clean water.